I posted a while back about the fact that we were undecided about what to do for a holiday this year (see Holiday Planning). I was leaning towards staying in Switzerland to keep the cost down, but still harboured hope that we could go somewhere with a beach to make sure we had a "proper" summer holiday. For me, a beach is a key ingredient of a real summer holiday, so our search always kept this in mind. 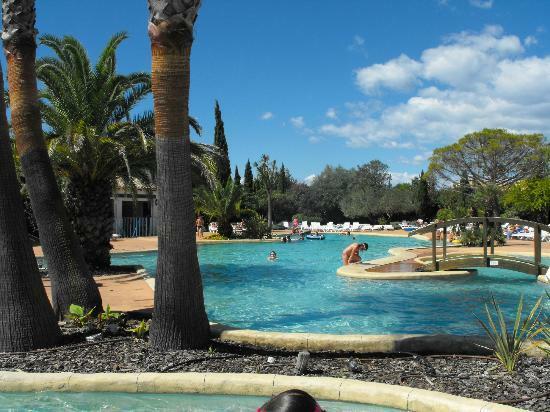 After much deliberation and searching, we came across a camp site in the Aigues-Mortes area in the south of France, which is next to the Mediterranean Sea and therefore guarantees a beach-assisted holiday. We plan to go with some friends to the camp site that promises to be child friendly, and has lots of activities for kids to do. It has a huge swimming pool area, plenty of playgrounds, entertainment, a bakery and a restaurant plus loads more facilities to help enjoy our stay. We'll be staying in a little cottage with it's own terrace area, that should be ideal for meals and evening drinks to wind the day down. We'll be driving to get there in a journey that should take around 5 hours to complete. We have never before undertaken such a mammoth drive with Lydia as a passenger, and given that she oftens complains when a trip takes longer than half an hour, this would seem somewhat foolhardy on our part. We plan to leave in the early hours of the morning in the hope that Lydia will sleep in the car, but fortunately my in-laws bought us a portable DVD player to keep Lydia occupied on our recent flight to England, and it can be attached to the back of a head rest in the car for the passengers to view, so this - with any luck - will entertain a restless Lydia during the trip. I have already recorded a few episodes of In the Night Garden, Postman Pat and T'Choupi - all Lydia's favourite TV shows - onto DVDs, to make sure we are well prepared for any eventualities. I'll also try to get some music on there and some children's music videos (there are loads on YouTube), as that will no doubt help Lydia forget about that she is stuck in a car for such an extended period of time. Aside from the slight hesitancy over the long drive to get to the camp site, I'm now really looking forward to going on holiday, and hopefully getting some sun in the south of France. The fact that there will be a beach involved only makes it better. I can already see us having a BBQ next to our little cottage, playing bowls on the lawn and generally having a great time as a little family. I can't wait to see Lydia exploring the sandy beach and getting her toes wet in the sea... She has experienced this before during our trip to Cornwall in England last year (see Holiday in Cornwall), and she wasn't a big fan of sand at the time, but now that she is a bit older, bigger and more worldly, she might get a taste for building sand castles with her daddy.